Six employees from Wilkinson Corporation broke away from the office for a couple of hours on May 17 to volunteer for Northwest Harvest, the only nonprofit food bank distributor operating statewide in Washington with a network of 375 food banks, meal programs and high-need schools, providing more than two million meals every month. 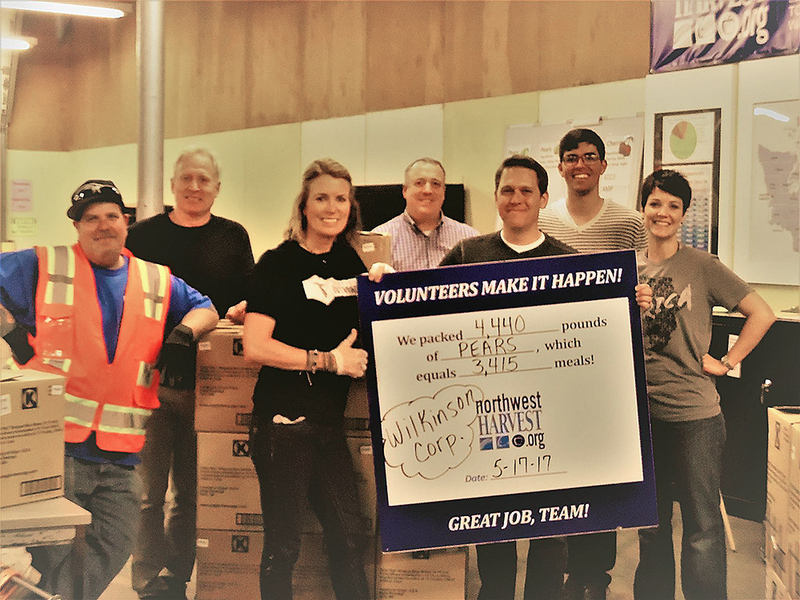 The Wilkinson team sorted pears donated by a local fruit packing house and repacked them (a total of 4,440 pounds equaling 3,415 meals) for Northwest Harvest to distribute. Northwest Harvest has decades of experience ensuring the constant supply of nutritious, in-demand products by purchasing a significant share of the food directly from local sources, two-thirds of which consists of highly nutritious fruits and vegetables. Northwest Harvest reaches rural communities with distribution centers in western, eastern, coastal and central Washington. In 2016, they set a distribution record of 33 million pounds of food, serving unprecedented numbers of hungry people—and 90 cents of every dollar donated goes directly to food distribution.